Land was acquired for the building of a chapel here on 30th October 1795. The chapel was founded in 1796 by Rev. William Williams (1732-99), Minister of Bethania Baptist Chapel, Pendre, Cardigan, and was completed the following year. Rev. Williams had an assistant named Thomas Harries. Harries died in 1797 when he fell into the river and drowned on his way home from a service at Bethania, Cardigan. Rev. William Williams died on 13th August 1799. In 1800 the chapel ceased to be a dependant of Ebenezer Baptist Chapel and instead became a dependant of Bethania, Cardigan. In 1800 Rev. Evan Jones, a young man from Llandysul, became the Minister. He was ordained in Bethania, Cardigan in November 1800. He was a very gifted and popular preacher and baptised many into the faith, but later he became increasingly dependant on alcohol. In 1810 he was ejected from his post due to his alcoholism, and this was a difficult time for the chapel. He was succeeded in June 1811 by Rev. John Herring, then aged 22. He was widely regarded as one of the most gifted preachers of his generation. In 1826 the chapel became independent of Bethania, but retained Rev. John Herring as its’ Minister. In 1829 there were about 80 members. In 1831 the old meeting house was demolished and the present chapel was built. The new chapel, measuring 38 feet by 25 feet internally, was opened on 7th July 1831 by Rev. John Herring of Siloam and Cardigan; Rev. J. Richards of Fishguard; Rev. B. Davies, Cilfowyr; Rev. Dafydd Phillips of Blaenwaun, St. Dogmaels, and others. It cost about £100 to build. On 2nd April 1832 Rev. John Herring died. In 1832 Rev. David Mathias of Cardigan became the Minister until his death in 1834, aged about 36. He was succeeded as Minister of Siloam later the same year by Rev. David Jones, who left for London in 1838 following a dispute with one of the large families who belonged to the chapel. By this date the membership had reached about 150, with about 100 attending the Sunday School. In 1838 Rev. William Roberts became the Minister here and at Penparc Chapel, Llangoedmor. He left for Tredegar in 1842. Rev. Richard Hughes became the Minister in 1843, but died on 20th July that year aged 47, less than six months after his arrival. In June 1846 Rev. Rees Evans was ordained here and became the new Minister, after studying at Pontypool. He remained at Siloam until 1850, when he moved to Neath. In 1851 Josiah Williams of Bryn Pedr was the Senior Deacon here. Sunday attendance was an average of 140 in the mornings, 90 afternoon scholars, and 120 in the evenings. In 1857 Rev. William Roberts returned to Siloam and became the Minister again until 1871. In June 1868 the Baptist Cymanfa was held at Siloam. Rev. William Roberts retired in 1871 and moved to Aberystwyth where he died on 25th March 1874 aged 73. In 1871 Rev. Thomas Phillips became the Minister of Siloam and Penparc, Llangoedmor. There was said to be no Minister in 1875, the reason for which is unclear. A surprise religious census in 1884 showed 140 attending in the morning and 159 in the evening. Rev. 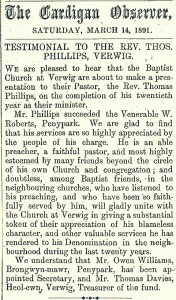 Thomas Phillips died on 28th October 1894 aged 60, at William Street, Cardigan. On 15th September 1896 Rev. John Price was ordained the new Minister, and remained so until 1951. In 1897 the chapel was united with Blaenwenen Chapel, Llangoedmor, under Rev. John Price. An Eisteddfod was held here on 19th May 1902. 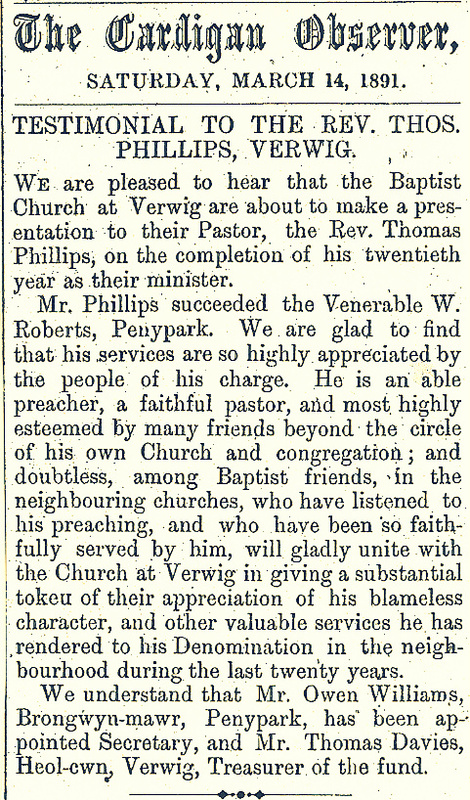 On 1st March 1911 Rev. 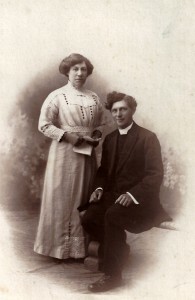 John Price, Minister of Siloam, married Hannah E. H. Watkin of London. An Eisteddfod was held here in 1912. In May 1912 tenders were being sought for building a vestry to plans by J. Teifion J. Williams of Cardigan. On 18th February 1925 a vestry was opened at Siloam. In 1928 Rev. John Price was the Chairman of the Carmarthenshire and Cardiganshire Baptist Cymanfa. In April 1929 new Deacons were elected, including Thomas Davies of Heolgwyddil; William Morris of Trecefn; and D. S. Nicholas of Towyn. In May 1933 tenders were sought for painting and redecorating the chapel. On 30th January 1934 the chapel opened following renovations by Messrs. D. Jones & Sons, Olmarch, Llechryd. Mrs. M. E. Morris of Trecefn Isaf opened the refurbished chapel. In 1939 George Martell Evans became the Secretary. On 20th September 1939 the following became trustees of Siloam: Rev. John Price, Lichfield, Cardigan; Evan Davies; William Morris, Trecefn Isaf; Benjamin Jones, Cartref; David Sambrook Nicholas, Towyn; David Owen Nicholas, Bryn Tivy, Gwbert; Thomas Davies, Brynawel, Cardigan; John Williams Evans, Dolgoed, Cardigan; John Lewis Davies, Gwynlys, Cardigan; Henry Davies, Lichfield, Cardigan; Thomas Owen, Capel, Cardigan; William Lewis Lloyd Davies, Tyhen, Cardigan; and David John Williams, Greenhill, Llangoedmor. Rev. John Price celebrated 50 years as Minister in October 1946, retired in 1951 and died on 21st May 1952. On 6th October 1953 Rev. G. Maxwell Evans became the Minister until 1957. He was succeeded on 22nd October 1963 by Rev. William Owen Williams of Kidwelly. In July 1964 it was noted that George Martell Evans of Hardware Stores, No. 14. Pendre, Cardigan, had been the secretary here for twenty five years. Rev. William Owen Williams, Minister, died on 18th June 1972. On 5th September 1973 Rev. Idris Hughes became the Minister here and at Penparc, Llangoedmor. He moved away in 1975 and on 7th June 1976 Rev. (James) George Elias became the Minister. In 1979 the Deacons were: J. J. Lloyd Davies (Treasurer), Vaughan Davies, Samuel Owen, Owen James Davies, Gwilym Owen, Bwynmor Griffiths, John G. Davies, G. M. Evans, Rice Llyd Davies, Ivor Davies and David Samuel Davies. In May 1982 Rev. J. George Elias left. There was no Minister here for another 7 years after that date. On 19th September 1989 Rev. Milton G. Jenkins, Minister of Cardigan’s Bethania Chapel and Blaenwenen Chapel, Llangoedmor, became the Minister. In August 1995 Rev. Milton G. Jenkins left for Caerphilly. In September 1996 a booklet was published, written by D. Sam Owen, celebrating the bicentenary of the chapel. On 29th October 1997 Gareth Morris was ordained as Minister. 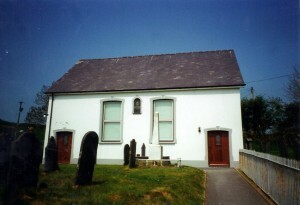 C19 and earlier Independent chapel, altered, in painted stucco with lateral façade, pitched slate roofs, plinth and raised stucco surrounds to openings. Façade is symmetrical with cambered headed doors to outer bays, cambered headed with painted stucco keystones, both later C20 boarded timber doors with glazed upper panels. Inner bays are paired massive cambered-headed lights with similar keystones. Both replaced in later C20 aluminium 2-pane frames. Slate sills. Plaque to centre, set high, with arched head, stucco surrounds, keystone and sill. Historic Houses of Pembrokeshire & Their Families, Francis Jones 1996.